The shuffle of Cass McCombs's "Run Sister Run" arrived on the songwriter's Mangy Love LP earlier this year. Now, the track has been treated to a video that features the inspiring story of a Canadian track and field athlete who looked to raise awareness to the country's missing and murdered indigenous women. 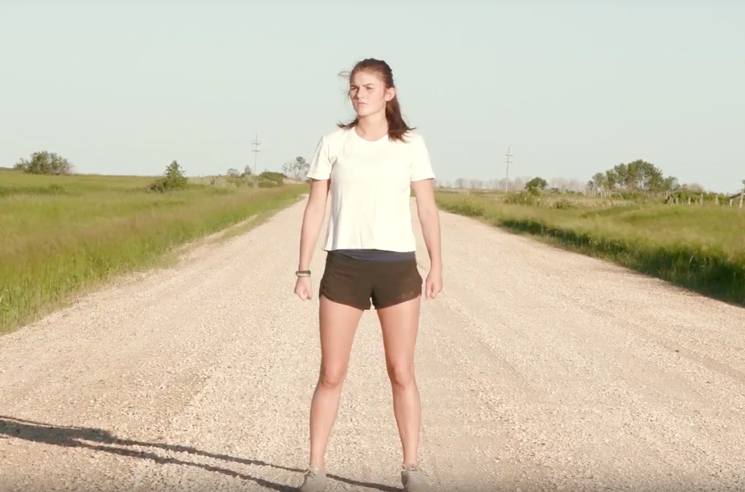 The video follows Manitoba native Tracie Léost, who set out on a four-day, 115-kilometre solo trek on foot to bring attention to what she believed was an epidemic. In the clip, Léost dons her running gear and a pair of moccasins in recreating her run, striding through rural Canada past memorial bouquets and dresses hung up to commemorate the missing women. "Every second day it seemed like there was another story about a young First Nations female who had gone missing or murdered," Léost told Vogue. "And our prime minister at the time, Stephen Harper, denied that there needed to be an open inquiry into it. I kept bringing it up to my indigenous studies teacher until finally he said to me, 'If you want to see changes, why don't you do something about it?' "
The video was shot and directed by photographer and McCombs collaborator Rachael Pony Cassells, who thought of the young runner's story when asked to make a video for Mangy Love. The project ended up becoming a family affair, with Léost's grandfather making a Steadicam out of hay bales and a blanket, while her mother drove the truck for tracking shots. "I was thinking of film and I was drawing a blank on images of strong women running in films," Cassells told Vogue. "All my immediate thoughts were of women being chased....Women running in public space is an act of defiance." In completing her run, Léost raised more than $6,000 for the Families First Foundation, which helps the families of missing and murdered indigenous women and girls. Prime Minister Justin Trudeau has since opened the long-awaited public inquiry Léost began running for. McCombs's Mangy Love is out now through Anti-. Watch the video for "Run Sister Run" and a short documentary about its creation in the players below.